The hacker, who recently claimed responsibility for the high-profile hack of Democratic National Committee (DNC), has now taken credit for hacking into the Democratic Congressional Campaign Committee (DCCC) as well. To prove his claims, the hacker, going by the moniker Guccifer 2.0, dumped on Friday night a massive amount of personal information belonging to nearly 200 Democratic House members onto his blog. The notorious hacker published several documents that include cell phone numbers, home addresses, official and personal e-mail addresses, names of staffers, and other personal information for the entire roster of Democratic representatives. The data dump also includes several memos from House Minority Leader Nancy Pelosi’s personal computer, detailing fundraisers and campaign overviews. "As you see the US presidential elections are becoming a farce, a big political performance where the voters are far from playing the leading role," the hacker wrote in a blog post. "Everything is being settled behind the scenes as it was with Bernie Sanders." 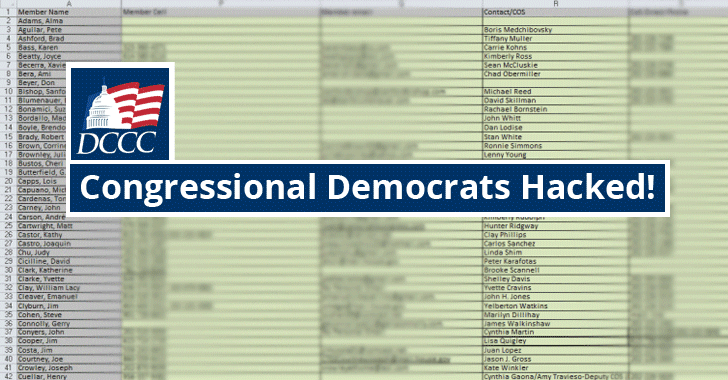 The leaked data dump includes passwords to access multiple DCCC accounts as well as coordinated shared passwords used by the committee. The Guccifer 2.0 is the same hacker who claimed responsibility for the recent widespread DNC hack last month, although the United States officials believed he’s actually a persona created by Russian government hackers to influence the US presidential election. WikiLeaks published nearly 20,000 emails from top DNC officials that were obtained from Guccifer 2.0’s previous hack. However, Guccifer 2.0 has dismissed any connection to Russia, but in his blog post, he called the US political system a "farce," in which voters are no longer playing any leading role. Guccifer 2.0 said the DCCC hacking was "even easier than in the case of the DNC breach." "The unauthorized disclosure of people’s personally identifiable information is never acceptable, and we can fully expect the authorities will be investigating the posting of this information." Although Guccifer 2.0 said this latest leak is for people who have "right to know what’s going on inside the election process," not a single leaked documents appear to prove this, rather they disclosed personal details and choice of passwords by the Democrats.